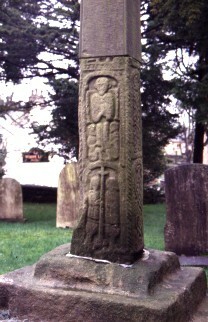 Base of Cross, in churchyard. West face of base of cross. There are the remains of two panels from the bottom of the shaft. The lower panel has two figures standing on either side of a cross on a long staff. The upper panel has a standing figure, and two figures seated below him facing each other. Collingwood, W.G., Northumbrian Crosses of the pre-Norman age 1st, Faber and Gwyer, London (1927) High Crosses, Northumbria, Anglo-Saxons..